Fairy gardens are all the rage these days, mainly because they're so adorable, and they make a whimsical point of interest in nearly any garden landscape. You can create a very simple fairy garden in a planter, or you can create a larger scene in an established garden if you like. You can even create both if you find you have full blown fairy fever. You can learn how to make a fairy garden of your own with just a few basic elements by following specific projects and using helpful tips. This quick project is perfect for a first timer, and only takes about 15 minutes to complete. Creating your garden in a planter means you can easily move it indoors or outdoors as the weather permits. Fill the the pot about 2/3 full of potting mix. Remove the succulents from their pots, and loosen the soil a bit around the roots. Using a clock face as a guide, plant one succulent at approximately 12:00. Plant the second succulent at about 7:00. Fill in around the plants with a little extra potting mix as needed. Place the pond between 3:00 and 4:00, and push it into the potting mix until the outer edge is about level with the soil. Place the fairy figure at about 10:00. Finish by adding more soil if necessary, and then sprinkle a bit of gravel over the soil. Water lightly and you're finished. 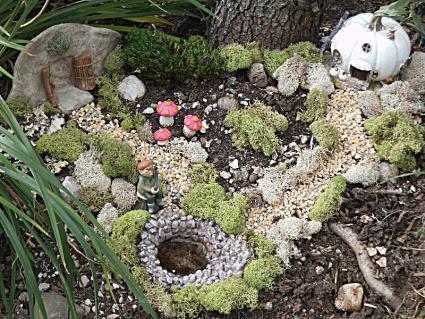 Although you'll see a a specific fairy garden figure and other elements in this project, you can select your own pieces and follow the same basic plan to create a unique fairy garden you'll be proud to show your friends. Choose the spot for your fairy garden, clear any weeds out of it, and contour the soil as you like. You can level it, or perhaps make it higher in the back with additional soil. Pick the perfect spot for the house, typically near the back of the layout. Group the mushrooms in front of the house at a short distance from it. Place the pond a little further away from the house. Place the fairy figure near the pond. Pour a narrow, slightly winding path of gravel from the front of the house to the pond. Pat it down a bit to set it into the soil. Position your small landscape stones wherever you think they look good. Place an assortment of mosses around the house, path, and pond. Use the wire cutters to cut three inch lengths of floral wire, bend each piece in half, and push it through the center of each piece of moss to anchor it into the ground. If you decide to add a second house, place it wherever you think it looks best, and then add its path and arrange the moss just as you did for the first house. Now you have a basic fairy garden that you can add other elements to whenever you like. You can create a fairy garden indoors or outdoors. However, since many of the components of a fairy garden are tiny and fragile, an indoor garden often works better in areas where the weather might destroy the plants and accessories. Ideally, the garden should be outdoors since fairies are thought of as nature lovers who delight in the world's natural beauty. Choose a location where the tiny scale of the plants and décor are not overwhelmed by larger plants and the minute details of the garden can be fully appreciated without trampling on other plants. If an herb garden is already part of the outdoor landscaping, merging it with a fairy garden can be ideal. Containers for indoor fairy gardens can be any shape or size. You can make a long and slender garden on a windowsill or line up small pots on the ledge and dedicate each to a different garden area. A large round pot either by itself or surrounded by smaller satellite pots also works well. A fairy garden should be esthetically appealing, but not too cluttered with decorations. Small plants and flowers should be plentiful. Herbs are perfect for fairy gardens because many of them look like tiny trees and shrubs that fairies would enjoy surrounding them. They also impart the garden with a lovely mixture of aromas. These herbs can be pinched back or partially harvested to keep them from over growing their spaces. Use the excess in your cooking. Fairy roses, of course, are highly recommended. However, choose primroses if you want to keep a lower profile because they grow closer to the ground. 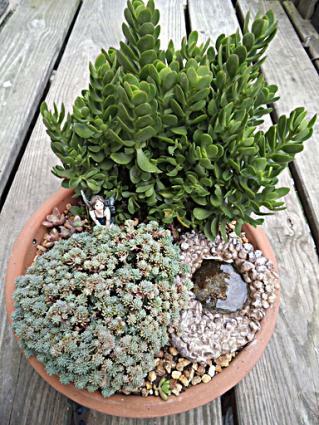 Succulents can be ideal for container fairy gardens since they tend to be small and slow growing. The following plants also make lovely additions to a fairy garden setting. Create a very natural-looking fairy house out of a small birdhouse and twigs. Use tiny pebbles and stones to build walls and pathways. Use buttons, nut shells, or even small silk flowers as pavers for your paths. Place a dollhouse-size table and chairs in the garden. If they aren't already waterproof, spray them with matte finish acrylic spray to protect them. Small fish aquarium ornaments, like bridges and castles, also work well as fairy garden decorations. You'll find them at any pet supply store that carries aquarium supplies. Miniature ceramic figurines of small animals, like birds and rabbits, make cute fairy pets. These are often found in gift shops that carry other kinds of figurines. If you prefer, you can purchase an assortment of figures and decorations made especially for fairy gardens. Many local garden centers offer a variety of miniature plants and accessories, but you can also find a wonderful assortment online. The following websites will give you a good idea of what's available. 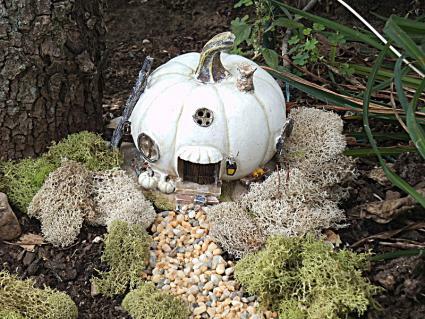 Amazon has a great selections of fairy garden accessories, including the white pumpkin house used in the landscape project on this page. Fairy Garden Store offers every type of fairy garden landscape accessory you can think of, including a cute teapot house and frog pond, as well as moss and other natural landscaping materials. Baker's Village sells a complete selection of fairy garden accessories. Glasshouse Works offers a wide selection of fairy garden plants, as well as an amazing collection of succulents suitable for planter gardens. Plant Delights Nursery's assortment of fairy garden plants includes gems like Asarum forbesii 'Mercury' and adiantum venustum (Himalayan maidenhair fern). Miniature Garden Shoppe carries one of the best selections of true miniature plants, including several varieties of Piceas and Sedums that work very well in one of these gardens. There's really no right or wrong way to create a fairy garden as long as you're satisfied with the way it looks once you're finished. In fact, don't be surprised if you find yourself adding on to your garden or creating more small fairy gardens in your planters. This hobby can be quite addictive, but it will certainly add more enjoyment to the time you spend in your garden.